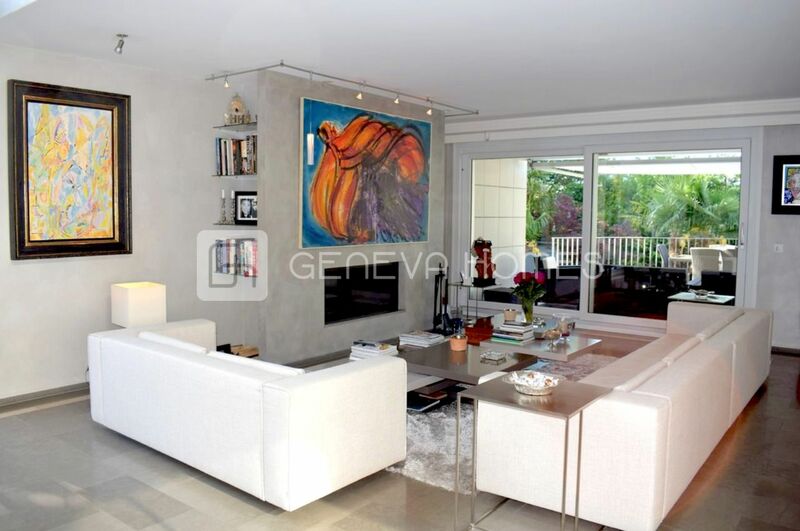 This contemporary style duplex apartment was built in 2008 and is ideally located close to the heart of Geneva but is a green area. With really top class finishings, this apartment has high ceilings and large windows that make it exceptionally bright. The 245m2 of living space are distributed as follows : Ground floor: - large living room - dining room with a fireplace that has access to the terrace and to the 550m2 garden - visitors toilette - fully equipped kitchen - bedroom - bathroom The first floor: - master bedroom that has an office area and a dressing area of 50m2 - 2 bedrooms - a family/playroom - bathroom with a shower The apartment also has the following interesting and useful features: - storage room - laundry room - all windows are noise reducing - alarm system with video cameras.